The final phase of the operation began on 11 March. The 3d and 4th Divisions drove rapidly to the east coast in their zones of action, eliminating the last organized resistance, and by 13 March only two stubborn pockets held out in those areas. At the northern end of the island 5th Divisions troops pushed slowly northward against bitter opposition, but by 16 March the last of the Japanese were bottled up in the western half of Kitano Point and the rocky gorge near the coast 500 yards to the south. In this last desolate, shell-torn draw the enemy held out until 26 March (D-plus-35), ignoring all inducements to surrender. Artillery, air, and naval gunfire could be used only in the extreme northern end of the island during these last days of the battle. There the Mustangs (P-51's) of the 15th Fighter Group provided effective close support until 14 March, and all Marine artillery battalions combined to fire heavy preparations and harassing fires until withdrawn from the fight on the 16th. Destroyers performed most of the naval gunfire missions, but the heavy cruisers Tuscaloosa and Salt Lake City fired until 12 March. From 17 to 24 March, destroyers furnished illumination and then they too were withdrawn. Elsewhere, the lines were in such close proximity and the enemy-held areas so small that tanks and half-tracks had to replace these heavy support weapons. The 1st Battalion, 9th Marines, which had launched an attack northeastward from the 4th Division zone of action on 10 March, continued the assault on 11 March with two companies abreast. This drive was intended to sweep the last hostile troops from the ridge in the southeast corner of the 3d's zone and make contact with 3/9, which was moving south along the coast against the same high ground. Then both battalions would turn west to attack Cushman's Pocket from the rear. the ridge. The 3d Battalion also requested Shermans, but not until early afternoon did armor reach the front in that zone of action along a road cut through by an armored dozer. With this support, the 1st and 3d Battalions crushed the opposition and made contact at 1515. After the junction these units mopped up along the coast and then organized a defense for the night in high ground just east of Hill 362C and outposted the beach. About 500 yards westward, the 3d Battalion, 21st Marines, attached to RCT 9, continued battering against the southwest edge of Cushman's Pocket. Although this pocket was contained on only one side, the Japanese made no effort to sally forth for offensive operations or to withdraw. Instead, they held their ground and conducted a bitter defense in place from caves, spider traps, and dug-in tanks. No artillery fired in support of the 3d Division on 11 March, but the 1st Battalion, 12th Marines was held ready for call fires if needed. The other three battalions of the 12th reinforced the fires of the 13th Marines. Aerial observers maintained surveillance of the 3d Division's zone of action during the day and reported the location of friendly troops. As the 5th Division's east (right) flank worked slowly northward during the next four days, the 1st Battalion, 21st Marines moved in the same direction across the division boundary to protect the 5th's flank. With its lines tied to Company I, 27th Marines, the battalion held positions along the cliffs overlooking the coast and sent combat patrols out along the beaches below. The advance of the 5th Division governed progress along the bluffs and shorelines. 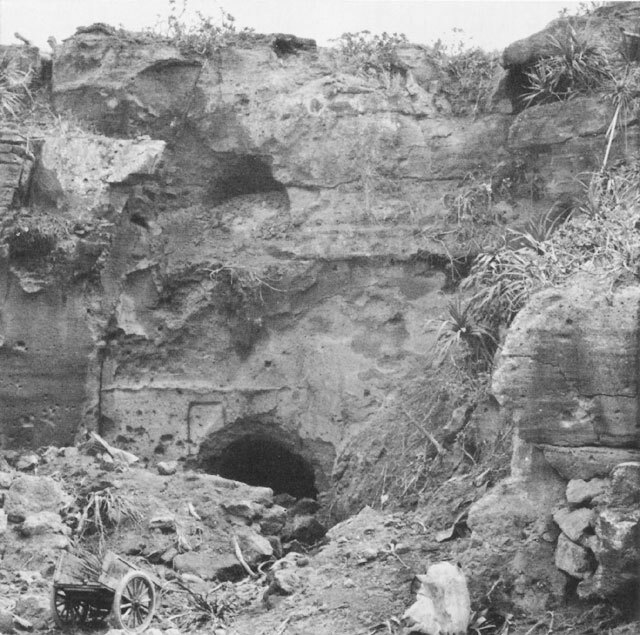 Marine engineers and infantrymen continued destroying pillboxes and caves during the hours of daylight, but at night the enemy crawled out of other caves and holes to hurl grenades and then dart back into their hideouts. Alert Marines shot and killed many of these night raiders before they could make good a retreat. By 15 March, the 1st Battalion, 21st Marines had extended about 600 yards northwestward into the 5th Division zone and held positions along the bluff and outposts down on the beach. The 2d Battalion, which reverted to RCT 21 reserve on 11 March, spent the daylight hours in reorganization and resupply, but manned a regimental reserve line during the night. were so well concealed that they escaped detection until Marines were almost on top of them. As usual in this type of fighting, the infantry flame throwers and demolitions proved the most successful weapons. The 3d Battalion, 21st reverted to its parent organization on 13 March and left its position on the west side of the shrinking pocket. The 1st and 3d Battalions, 9th Marines continued pressing the attack from the east. On the north flank, 3/9 completed reduction of that portion of the pocket in its zone of action, and 1/9 made substantial gains to compress the enemy-held area to about 250 yards on a side. Regular Shermans and flame tanks operated very effectively on the 13th, neutralizing a number of concrete emplacements. Upon completion of its assignment against the pocket, the 3d Battalion, 9th was ordered to the Hill 362C area where it undertook a systematic mop-up. NAVAL GUNFIRE caused landslide which partially blocked entrance to this cave in cliffs above northeastern shore. 3d Division units held positions along the top of these cliffs and outposted the beaches as they waited for the 5th Division to advance northward. 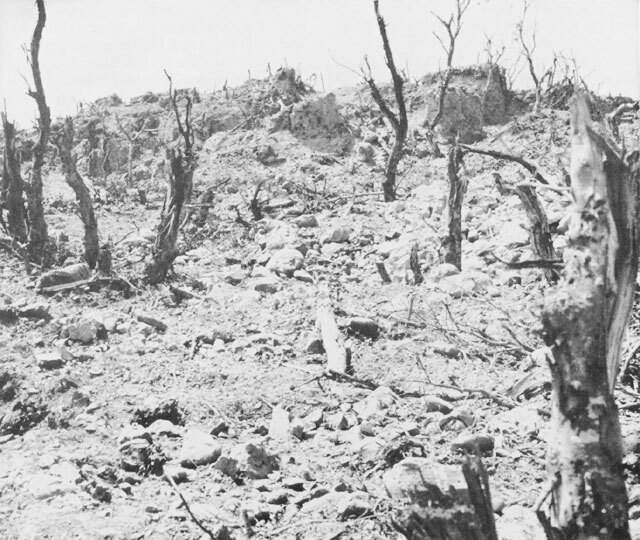 THE LAST POCKET of enemy defenders in the 4th Division zone of action held out in a jungle of small sandstone buttes and withered vegetation. 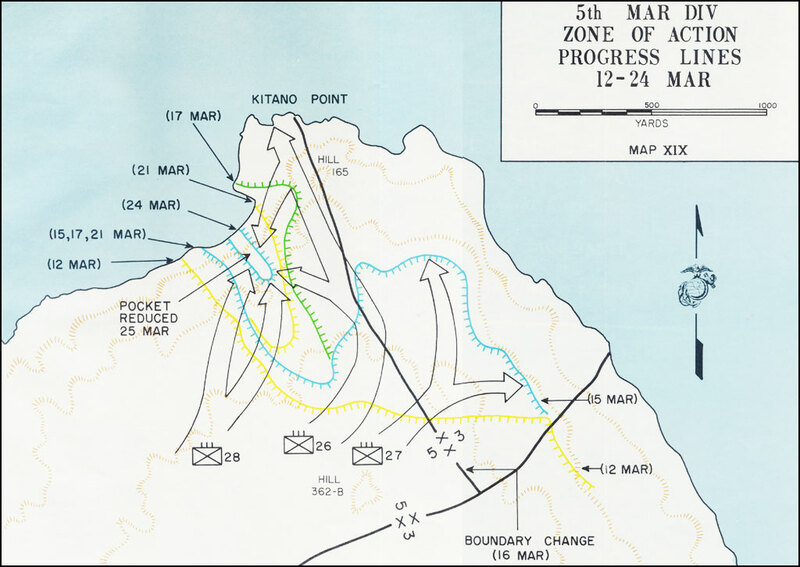 The next day, 14 March, operations against Cushman's Pocket entered the last phase. The 1st Battalion pressed the attack during the morning and early afternoon to gain about 100 yards. Then at 1530, the 2d Battalion passed through that unit to finish the job. A large capacity flame-thrower tank, on loan from the 5th Division, and Shermans from the 3d Tank Battalion scorched and pounded the last enemy defenses until only sporadic resistance challenged infantrymen as they moved in to finish the task. The impressive gains by the 4th Division on 10 March had placed Marines in position to launch a quick drive southeastward to the sea to eliminate the last resistance in the island's eastern bulge. Patrols sent out by the 23d Marines reported little opposition between that unit's front lines and the coast, and the 25th Marines, although encountering stiff resistance at the close of the day, had occupied commanding ground in its zone of action. TANKS AND INFANTRYMEN make a frontal assault against Japanese positions at the base of a rocky ridge in the 5th Division zone of action. A PORTION OF CUSHMAN'S POCKET, scene of the last organized Japanese resistance in the 3d Division zone of action. sending strong patrols to cover all beach areas. Engineers followed close behind the advance, working with the infantry to seal caves and push a road forward in the regimental zone. The 1st Battalion relieved 2/23 on the left at 1700, and the regiment pulled back and settled down on the same positions it held the preceding night. This line, about 400 yards from the coast, provided the best ground for control of the area as terrain to the front was characterized by broken ridges and deep fissures. The plan of attack called for 2/25 to attack down the draws toward the coast while 3/25 and 2/24 supported the attack by firing bazookas, antitank grenades, and 60mm mortars into the area to their front. Following this general scheme, the regiment slugged it out with the Japanese in the pocket for four days. Tanks operated with caution in supporting the attack because of the danger of hitting friendly troops, but both regular and flame throwing mediums contributed in large measure to the eventual success of the infantry. But as in all actions against a deeply entrenched and determined enemy, it took foot troops with flame throwers, bazookas, rifles, grenades, and demolitions to complete the job. Frequent attempts to persuade the Japanese to give up invariably drew heavy rifle fire, and the fighting went on. As the operation against the pocket continued, the main core of the resistance developed northwest of the "beach road." This road, or what was left of it, paralleled the east coast from the Boat Basin to Tachiiwa Point about 500 yards inland. Plans were made to send tanks out along the road to positions in rear of the pocket to fire north into the draws in an attempt to knock out hostile mortar positions. To accomplish this, 2/24 with engineers attached, pushed forward from positions astride this road to clear it of mines so that the Shermans could proceed. After they had cleared the wash, infantry and engineers were ordered back as their presence along the road prevented the use of supporting fires by 2/25. The tanks remained and projected streams of flame up the draws with good effect. On 15 March, Colonel Lanigan, commanding RCT 25, shifted the main pressure against the pocket to the south and directed the skeleton companies of the two battalions in the center of the line to attack regardless of contact. This drive gained 200 yards and penetrated deeply into the left flank of the enemy's strongest positions, paving the way for elimination of the stronghold the next day. During the night, enemy troops made several attempts to infiltrate Marine lines from the south, but each time the movement was detected and broken up. When the 25th jumped off at 0630 on 16 March, the Japanese fought back with machine guns, rifles, and grenades, but now, without any real organization left, they resisted only in small isolated groups. By 1030 all battalions had cut through to the beach road, and RCT 25 announced complete destruction of all resistance in the pocket. While the 3d and 4th Divisions were clearing the last defenders from their zones of action, the 5th Division made the corps main effort to the north. 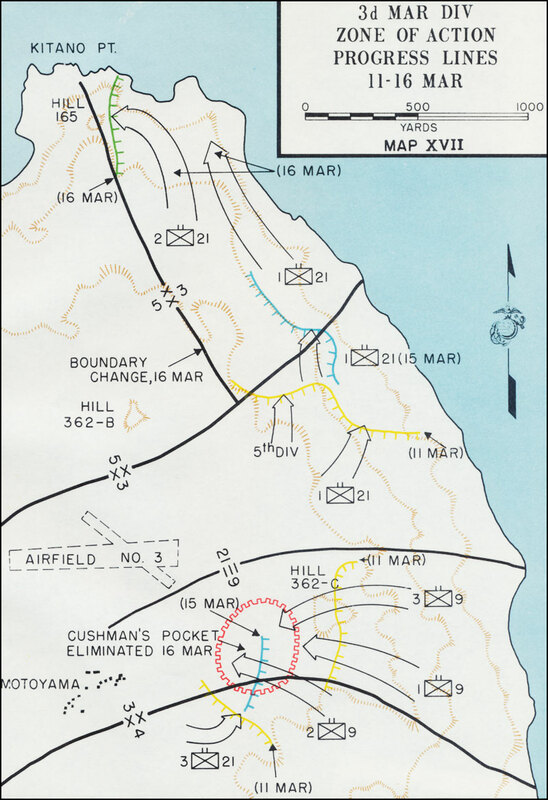 On 11 March, following a 50-minute preparation by air, naval gunfire, and the massed fires of 12 artillery battalions, the 28th Marines jumped off on the left with three battalions abreast (2/28, 1/28, and 3/28 left to right), and the 27th, with 1/26 attached, attacked on the right with 1/26, 1/27, 2/27, and 3/27 in line. AMERICAN FLAG FLYING AT NORTH END OF IWO. 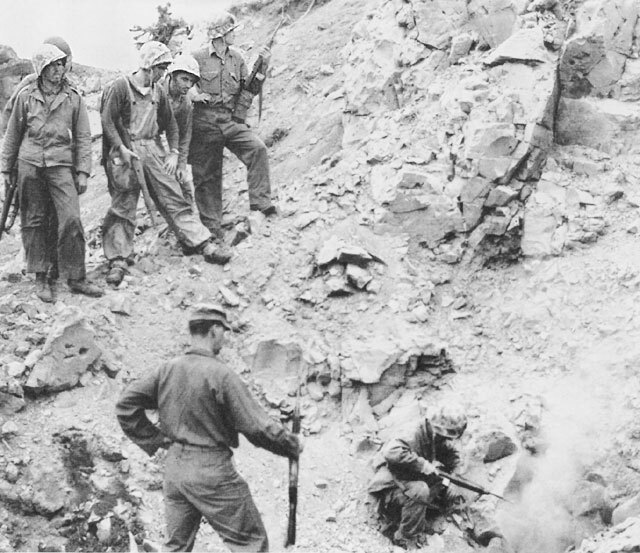 5th Division Marines planted the colors on Hill 165 at Kitano Point 25 days after the flag raising on Suribachi. to blast located enemy weapons, and 7.2-inch rockets were again employed to shock the Japanese into silence. But results were negligible. The battalion mortars and attached 4.5-inch rockets, firing almost continuously as close to the lines as possible, actually rendered the most effective aid. 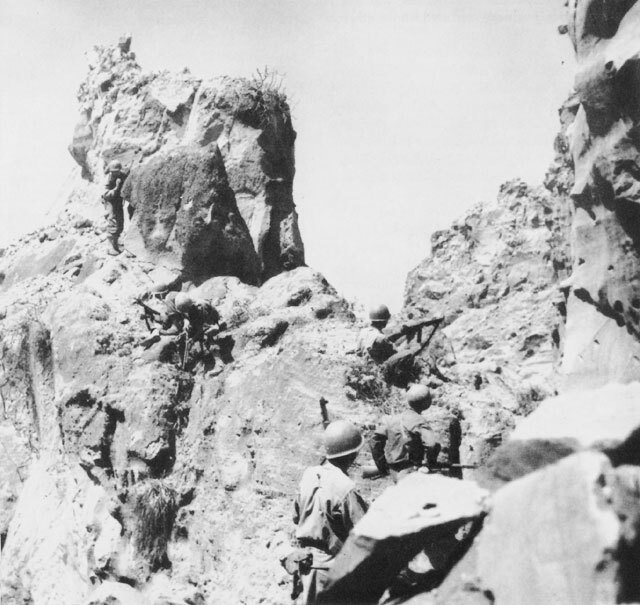 The 28th Marines inched forward about 30 yards up the gradual slope toward the northwest-southwest ridge line overlooking the gorge to its front. Atop this ridge the Japanese held strong fortifications that commanded all approaches from the southwest, and when Marine bombardment became intolerable they took refuge in caves that honeycombed the steep sides of the gorge. Bitter fighting produced slightly better gains in RCT 27's zone of action. During the morning, 2/27 was pinched out and became RCT reserve as the 1st and 3d Battalions moved forward. Actually, this unit was so casualty ridden that it could no longer be considered employable and saw no further action as an organized battalion. The 1st Battalion cleaned out a pocket to its front that had been holding up the advance in that zone for five days, and 3/27 seized and held some important high ground after three bloody assaults. On the regiment's left flank 2/26, which had been attached to RCT 28, reverted to parent control and attacked through 1/26 at 1300 for a small gain. The night was fairly quiet along most of the front, but activity behind the lines of 3/27 became so heavy that company command posts moved up to tie in with their front line platoons for security against grenade-throwing Japanese soldiers who came out of bypassed holes. The 5th Division continued its pressure against the ridge above the gorge and carved out small gains on the right, but with tank support limited by the rough terrain and heavy weapons unable to fire close to the lines, the going was slow and tough. Companies were reduced to platoon size, and the few veteran Marines remaining were exhausted. The majority of experienced and aggressive small unit leaders had long since been evacuated or killed, and while replacements were courageous and willing, they lacked the ability that comes only through experience. Army planes flew the last air support missions of the operation on 14 March when five P-51's dropped fire bombs (gasoline and diesel oil mixture) and strafed in front of 3/27 from 1030 to 1100.20 From then on, the narrow confines of the area of operations prevented use of those planes that had performed so well in supporting ground troops. Artillery and destroyers continued to furnish limited support, firing a preparation for RCT 26 on 15 March and performing night harassing and illumination missions. 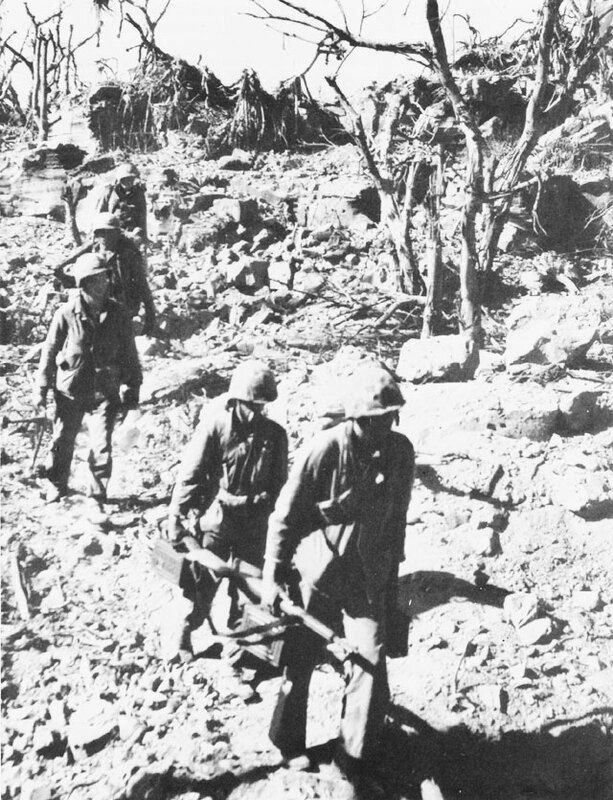 The 28th Marines (less 3/28), with the 4th Pioneer Battalion attached, was now to hold positions along the ridge southwest of the draw and support RCT 26 (3/28 attached) by fire as that regiment attacked northwest to overcome the strong point to its front and bottle up enemy remnants in the deep ravine. THE BATTLE FOR THE GORGE was fought over terrain such as this. In this picture a Marine light machine-gun squad moves up to join in the final battle. increased, and Japanese fire from close ranges remained deadly. At 1800, on 16 March, 26 days and nine hours after the first Marine landed on Iwo Jima, the island was declared secured. The only remaining resistance came from the western half of Kitano Point and the draw to the southwest. In this gorge, approximately 500 die-hard enemy troops continued a more or less organized defense for another nine days. 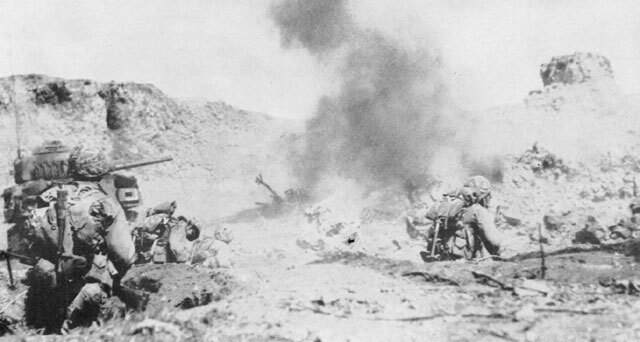 Attacking on 17 March to clear the remaining enemy from Kitano Point, the 26th Marines gained rapidly. The 1st Battalion advanced against moderate rifle fire and reached the north coast at 1230. The battalion then turned its front southwestward to drive against the gorge in front of RCT 28. The 3d Battalion, 26th and the 3d battalion of the 28th registered some slight gains against the northeastern edge of the pocket. The gorge in which the last resisting Japanese were now cornered was rocky and steep-sided, approximately 700 yards long and between 200 and 500 yards wide. Rock outcrops cut this ravine into other minor draws that constituted major obstacles to all types of movement. The entire area was ideally suited to the type of last ditch defense the enemy had adopted. All routes into the main gorge were swept by heavy and accurate fire from machine guns and rifles concealed in cave positions in the cliffs and outcrops. The plan for attacking this strong point called for RCT 28, with attached elements of the 5th Pioneer Battalion and Division Reconnaissance Company, to hold the southern rim along the steep cliffs, while RCT 26, with 3/28 and 3/27, worked in from the north and east. For the next nine days exhausted Marines carried out a battle of attrition against the thoroughly entrenched enemy. Advances into the east end of the ravine were measured in yards as each cave had to be sealed off before further progress could be made. Flame-thrower tanks, armored bulldozers, and infantry combined operations to provide the power and teamwork necessary to penetrate the last stronghold. After its relief by RCT 21 on 16 March, RCT 27 reorganized its depleted units into three battalions of two rifle companies and one headquarters company each. Then at 1700, Companies A and D were attached to the 3d Battalion and that unit was constituted as a composite battalion under Lieutenant Colonel Donn J. Robertson. This consisted of a headquarters and four rifle companies, numbered 470 men, and was attached to RCT 26 on 19 March. 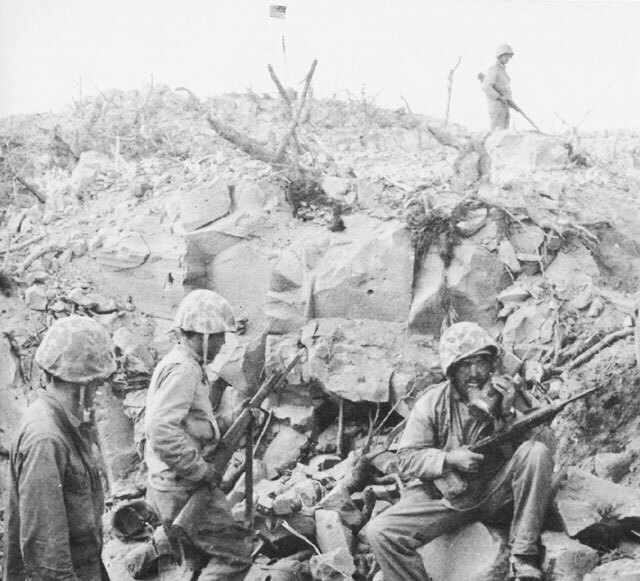 The 27th Marines, less the Composite Battalion, remained in division reserve during the remainder of the operation, mopping up rear areas and making preparations to leave the island. As the Marines drove slowly but relentlessly down the ravine, resistance became centered around a huge concrete structure built into a knoll near the eastern end. This igloo-shaped installation was surrounded by mutually supporting caves and absolutely impervious to 75mm tank shelling and demolition attempts with 40-pound shaped charges. After two days of assault during which Marines silenced the supporting positions, engineers with bulldozers sealed a door on the north side and then demolished the structure using five charges totaling 8,500 pounds of explosives. SURRENDER APPEAL is made by Japanese-language officer after grenade dropped into the cave entrance had no effect. Of all Marine propaganda attempts, the most elaborate was General Erskine's effort to get a message to Colonel Ikeda. Believing that General Kuribayashi might feel himself personally committed against surrender, the 3d Division Commander addressed an appeal to the commanding officer of the 145th Infantry Regiment, elements of which were known to be defending the Kitano sector. This message was entrusted to two POW's, former privates in the 145th Regiment, who claimed to know the location of the Japanese colonel's command post. In addition to cigarettes and rations, the two Japanese emissaries were equipped with a walkie-talkie (SCR-536) radio with which they were to maintain contact with "Smith-Chui," the 3d Division Language Section. The pair of volunteers made several contacts with groups of Japanese soldiers as they picked their way over the rough terrain toward the objective but did not desert their mission. After a few transmissions during the morning, the Japanese couriers discontinued use of the radio for fear it might jeopardize their security. One of them stopped to rest his wounded leg, but the other continued the journey. Six hours after starting the trip, the leader of the expedition succeeded in reaching Ikeda's cave where he gave General Erskine's message to one of the headquarters guards for delivery to the colonel. Half an hour later the guard returned with information that he had given the letter to the regimental commander who muttered something about conferring with the general. When the POW heard this he beat a quick retreat from the cave and rejoined his companion. Breaking radio silence for the first time since morning, the two contacted "Smith-Chui," reporting that they were on the way back. They deviated somewhat from the original plan and re-entered the Marine lines in the 5th Division zone of action at 1830. Although they had no trouble surrendering themselves they did experience considerable difficulty in explaining what two Japanese were doing with a walkie-talkie. The set was taken away from them but subsequently returned to the 3d Division. Major Horie, Kuribayashi's Chichi Jima detachment commander, tried to communicate with the general on 17 march to inform him that Japanese Imperial Headquarters had promoted him to full general, but the message was not acknowledged. Then on the 21st, Chichi Jima received a message from Iwo, "We have not eaten nor drunk for five days. But our fighting spirit is still running high. We are going to fight bravely till the last." As soon as Marine units could be released, they commenced re-embarkation The 4th Division was first to load out, beginning on 14 March, completing the happy task on the 19th, and sailing for Maui the same day. Units of the 5th Division began loading on 18 March and departed Iwo, in convoy with corps units, on 27 March, headed for Hawaii. The 3d Marine Division (less 3d Marines) took over patrol and defense responsibilities from the other divisions as they moved out and conducted patrols and established night ambushes throughout the island. The patrols varied in size from one squad to a reinforced platoon and used tanks and, on one occasion, naval gunfire provided by a destroyer to support their operations. The 147th Infantry (USA), which was to take over the defense of Iwo, arrived from New Caledonia on 20 March and was attached to the 3d Division for operational control. By the 24th, units of Colonel Robert F. Johnson's regiment had taken over responsibility for the 21st Marines' sector and were providing most of the ambushes and patrols elsewhere. The capture and occupation phase of the Iwo Jima operation was announced completed at 0800, 26 March and the Commander Forward Area, Central Pacific, assumed responsibility for the defense and development of Iwo Jima. At the same time, Major General James E. Chaney, USA, took over operational control of all units stationed on the island, and Brigadier General Ernest Moore, USA, assumed the designation of Air Defense Commander. General Schmidt, who had commanded the largest Marine tactical force ever to engage an enemy, closed his command post and left Iwo by air at 1330. The VAC Headquarters embarked on the USS President Monroe. Units of the 3d Division began loading out on 27 March when the 21st Marines and the division command post moved on board ship. Other units of the division embarked as ships carrying garrison elements to Iwo became available. On 4 April, the 147th assumed full responsibility for ground defense and the 9th Marines moved down to WHITE Beach, ready for loading out. The last unit left on 12 April, arriving at Guam on 18 April. 1. Unless otherwise cited, material in this section is based on the following: 3d MarDiv SAR, Pt III; 9th Mar SAR; 12 Mar SAR; 21st Mar SAR; 3d TkBn SAR. 2. VAC OpRpt, 60; 3d MarDiv SAR, 18; 3d TkBn SAR, Pt III, 9. 3. 9th Mar SAR, Encl B, 4. 4. VAC OpOrder No 23-45 w/changes, 15Mar45. 5. 3/12 commenced embarkation on 16 March and was not available. 3d MarDiv G-3 Periodic Rpt No 31, 16Mar45. 6. Ltr LtCol T.R. Belzer to CMC, 22Apr53. 7. 3d MarDiv OpOrder 23-45, 15Mar45; 3d MarDiv G-3 Rpt No 31, 16Mar45. 8. 3d MarDiv G-3 Periodic Rpt No 31, 16Mar45. 9. Unless otherwise cited, material in this section is based on the following: 4th MarDiv OpRpt, Sec. IV; 14th Mar OpRpt: 23d Mar OpRpt; 24th Mar OpRpt; 25th Mar OpRpt; 4th TkBn OpRpt. 10. 4th MarDiv D-2 Periodic Rpt No 68, 11Mar45. 11. 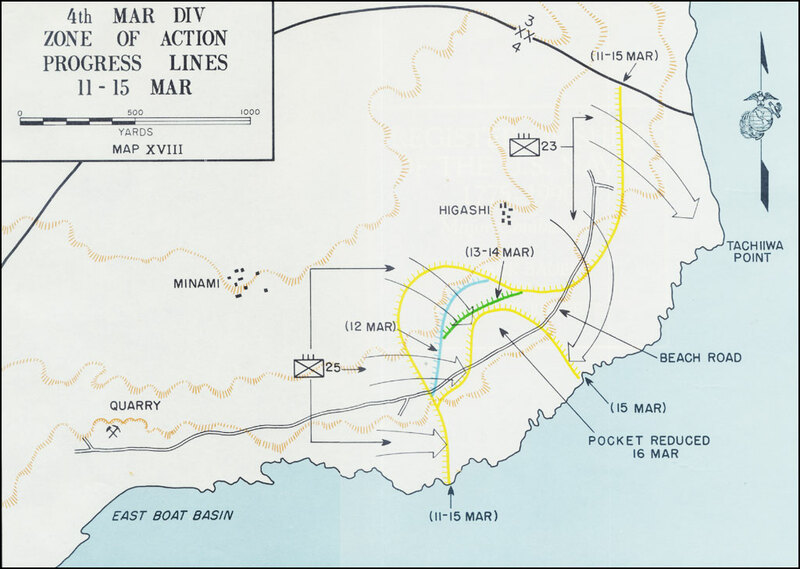 4th MarDiv D-2 Periodic Rpt No 69, 12Mar45. 13. 4th MarDiv D-2 Periodic Rpt No 73, 16Mar45. 14. Unless otherwise cited, material in this section is based on the following: 5th MarDiv SAR, Sec. VIII; 13th Mar SAR; 26th Mar SAR; 27th Mar SAR; 28th Mar SAR; 5th TkBn SAR. 15. C-2 Periodic Rpt No 22, 12Mar45. 16. Company B, Amphibious Reconnaissance Battalion, FMFPac, Action Report, Iwo Jima Operation, 29Mar45, 3. This unit was attached to VAC for the Iwo operation. 17. Occupation of Kama and Kangoku received serious consideration both during the planning stage of the operation and after the landing. 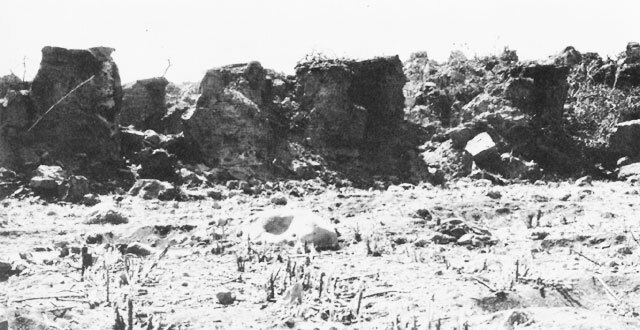 The rocks were not seized earlier because American troops posted there would have been extremely vulnerable to observed enemy fire from the much higher elevation of northern Iwo Jima. Also, because these islands were low in the water they provided no advantage of observation. Ltr LtGen E.A. Craig (Ret) to CMC, 6Apr53. 19. 5th MarDiv SAR, 27. 20. VAC Air Rpt, Appendix 3, 7. 21. TF 56 OpRpt, 10, 11. 22. This narrative of the battle for the gorge is based on the following: 5th MarDiv SAR, Sec VIII; 26th Mar SAR; 27th Mar SAR; 28th Mar SAR. 23. 5th MarDiv IntelRpt, 27. 24. VAC IntelRpt, 19, 20. 25. The foregoing account of Erskine's attempt to communicate with Ikeda is based on the following sources: 3d MarDiv Supplemental Interrogation Rpt of POW No 69, 19Mar45; C-2 Periodic Rpt No 28, 18Mar45. 26. C-2 Periodic Rpt No 29, 19Mar45; 5th MarDiv Japanese Language Section, Preliminary POW Interrogation Rpt No 36, 18Mar45; 5th MarDiv D-2 Periodic Rpt No 26, 19Mar45; 3d MarDiv POW Identification Card, 21st Mar Prisoner No 83, 20Mar45. 28. The 5th Pioneers suffered nine killed and 31 wounded in this action and VII Fighter Command units lost 44 killed and 88 wounded. C-3 Periodic Rpt No. 35, 26Mar45; 5th MarDiv SAR, Annex W, 2. 29. For more detailed casualty figures see Appendix III. 30. C-2 Periodic Report No 35, 9Apr45. 31. Headquarters 147th Infantry Regiment, Report of Operations Against the Enemy, Iwo Jima, 11Jun45.